Western Whiskey Gazette (WWG): Another new find! 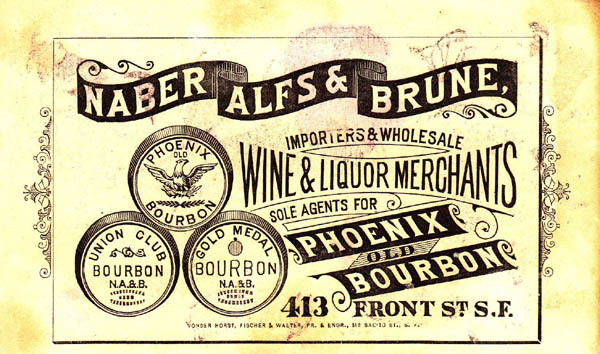 Naber, Alfs and Brune was established in either late 1879 or early 1880. The firm was originally located at 413 Front Street in "The City" (San Francisco). This dating puts it smack dab in the middle of the glop top era, and at the zenith of bottle production by San Francisco and Pacific Glass Works. One of their products is highly sought after, and equally valued, by collectors of western whiskies. The full faced Phoenix / Sole Agent fifth embodies the essence of glop top picture cylinders. The pint amber flasks, dating to roughly the same era, are equally attractive and sought after. But one main difference separates the two; in the past, the flasks have only been encountered with a tooled top. 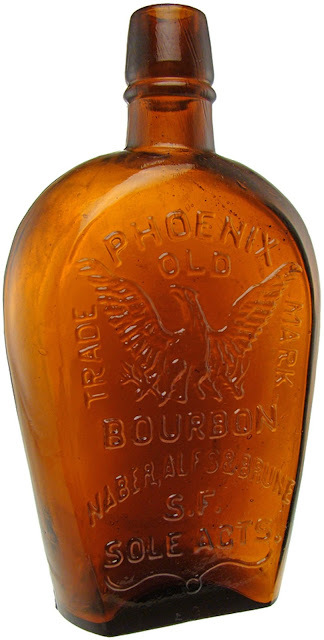 I received word that a killer amber pint Phoenix flask, with an "applied drippy top", saw the light of day for the first time in roughly 135 years, after being rescued from it's sun baked tomb somewhere in the Pacific Northwest. "Further inspection revealed no air vents but plenty of whittle". Stay tuned for photos! In the meantime, does anyone else out there have a glop top pint amber Phoenix flask? New variant of WC Peacock pre-pro glass?